The most noticeable part of any hammer, whether claw, ball-peen, or sledge, is the head. The head is made of metal and is the primary striking surface. Hammer heads are made through a process called hot forging, where a steel bar is heated to 1,200 to 1,300 degrees C.
The most noticeable part of any hammer, whether claw, ball-peen, or sledge, is the head. The head is made of metal and is the primary striking surface. Hammer heads are made through a process called hot forging, where a steel bar is heated to 1,200 to 1,300 degrees C. The bar is then either cut into sections called blanks or is fed continuously into a forge. The bar or blanks are then pressed between two dies, which are solid plates of steel that have cavities cut out of them like a mold. One die is stationary and the other die is attached to a ram to force the metal into the shape of a hammer head. This is usually done over several, differently shaped die pressed to align the metal inside the hammer head. Protruding flash (metal that was squeezed out around the edges of the die) is trimmed off, the hammer head is cooled, shot blasted with steam and then painted or covered in sealant. 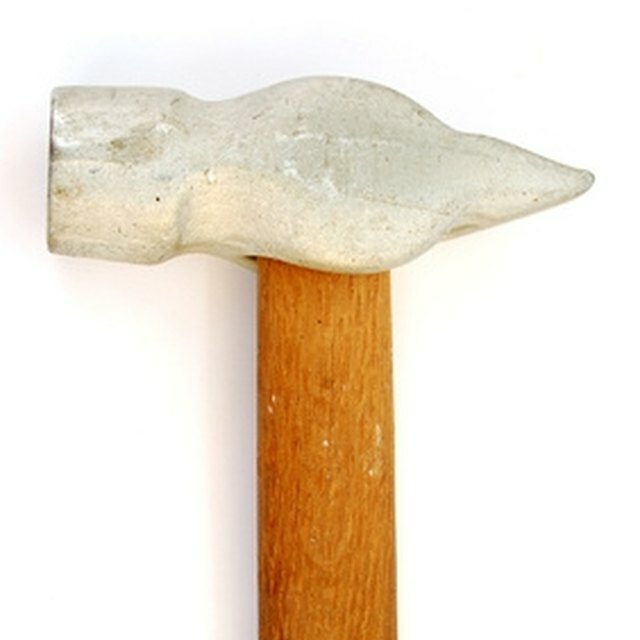 Traditional hammers have wooden handles. The handles are made by cutting a length of wood to the desired dimensions and then securing it on a lathe. The wood is then cut and trimmed until it has the proper form and dimensions to fit a specified hammer head, and a slit is cut diagonally in the top of the handle. Once the carving process is finished, the handle is cleaned, sanded and, if desired, given other treatments such as staining, painting, etc. For hammers that have wooden handles, the assembly process is fairly simple. The handle is pressed up into the bottom of the hammer head, into a place referred to as the adze eye. A wooden wedge is placed in the diagonal slit in the handle, and driven in. The wedge forces the handle to expand inside the adze eye, and the friction created causes the head to remain firmly attached to the handle. Once the wooden wedge is driven in smaller, steel wedges may be driven lengthwise across the handle to give some extra expansion as well as to hold the initial, wooden wedge in place. What Causes the Mildew Smell?